In my opinion, the visual sense is the most important of all five senses. There are many factors which affect our visual sense such as shapes and textures. Among these, “colours” have the strongest impact to my senses. Each colour symbolises something for me. For instance, “blue” symbolises the clear sky and the deep oceans. 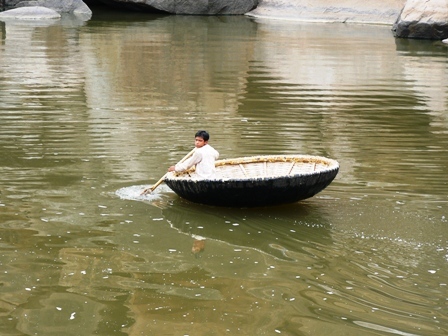 It also represents coolness and serenity. Colour “green”, on the other hand, symbolises the forest and the rolling hills of England. In this fashion, when I think of colours, the associated visual image will automatically pop up in my mind. For me, each country has colours that epitomise the country. Green, grey and blue are the colours for England – green of the grasses, the grey sky of semi-perpetual winter and the blue of the sky in the rare occasion that the sun decides to show up. Pale pink, blue, red & yellow and white are the colours for Japan – pale pink of the cherry blossoms, blue of the summer sky, red & yellow of the autumn leaves and white of the winter snow. And which colours do you think represent India? The answer is “multi-colours” – red, green, blue pink, purple, orange and any other vibrant colours that exist in the world! 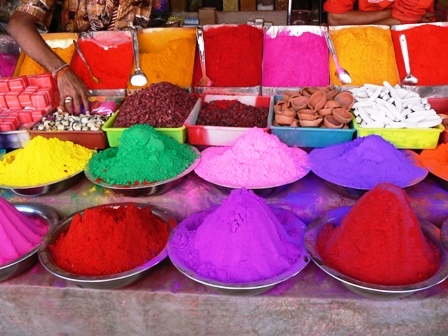 If you ever experience “Holi” in India, you will understand what I mean. 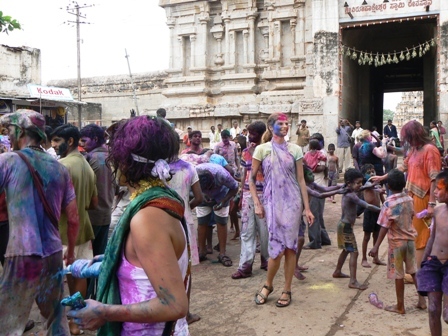 “Holi” or the “Festival of Colours” is a popular Hindu festival held in spring. 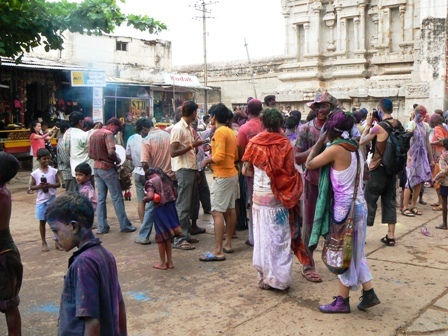 It is celebrated by people throwing coloured powder and coloured water at each other. 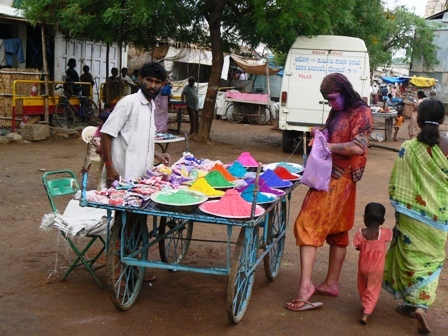 There are several legends connected with Holi. Its origin, however, was believed to lie with mischievous Krishna who threw coloured water over the gopis (milkmaids), and this developed into the practical jokes and games of Holi. Your clothes will be certainly ruined and you might sport colourful marks on your face for a few days. But all is done with good nature and I’ll guarantee you it is great fun! One of my most favourite drinks is “lassi”. Lassi is a drink made from curd (yoghurt) and water blended together and you can have it salty, spicy or sweet. Fruits such as mango and banana can be blended with yoghurt and water to make it fruity, too. Lassi is very popular in <?xml:namespace prefix = st1 ns = "urn:schemas-microsoft-com:office:smarttags" />India where it originates from. It is served chilled and perfect for hot weather! There are many restaurants and cafes in Mysore, India where you can enjoy delicious and, the most importantly, safe (to drink) lassis. Among these places, “Three Sisters” serves, in my opinion, by far the best lassis in town. 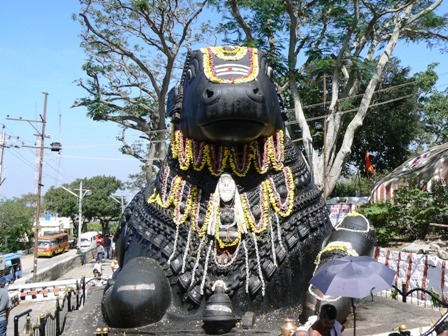 The place is called “Three Sisters” simply as it is run by three lovely local sisters in Lakshmipuram area of Mysore. Basically, they open up their house to yoga students for healthy and nutritious meals as well as terrific massages. The place offers lassis in many different flavours and they are all utterly delicious. Banana, coconut and chocolate lassi! All the ingredients are whizzed up in a blender with loads of ice, so the end result is a frozen style lassi – you can eat it with a spoon! You’ve got to try it if you ever visit Mysore. Unfortunately, I don’t have the exact recipe for it, but I can create near enough lassi with the following ingredients and method. Place all the ingredients in a blender and simply whiz them up until smooth. Chapati, sometimes called roti, is a thin, unleavened flat Indian bread. 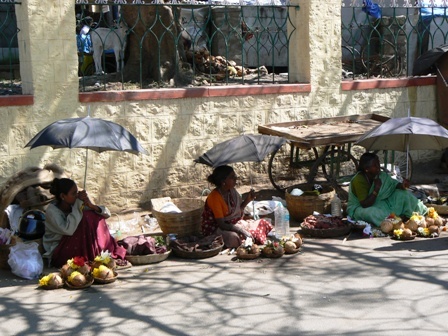 It is a staple food in the Indian subcontinent, and is served with almost all meals there. When I was in <?xml:namespace prefix = st1 ns = "urn:schemas-microsoft-com:office:smarttags" />India 5 years ago, I attended several Indian cookery classes run by lovely Tina. She and her husband own a café and a restaurant in Mysore, and their eateries are very popular amongst yoga students as well as locals. Anyway, I learnt to make chapatis during one of her classes. Chapati is actually one of the easiest bread to make. The dough is made with flour and water, and then small balls of dough, about the size of golf ball each, are rolled out thin and cooked on a griddle or a skillet. You can add a little bit of salt to the dough. Also a small amount of ghee (clarified butter) or oil can be added to the dough, and this will make the bread tender. 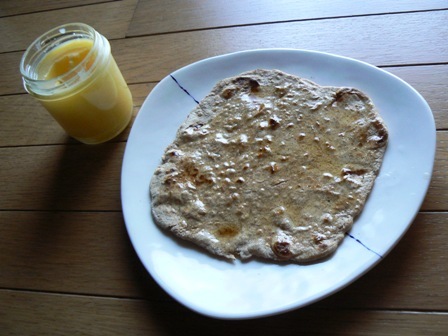 Traditionally “atta” flour is used for the bread, so if you can get hold of it, it will make the best chapatis. Atta is a special kind of whole wheat flour, made from hard durum wheat that is very finely grounded. Do not worry if you can’t find atta flour, as ordinary whole wheat flour can make good chapatis, too. Needless to say, chapatis are great accompaniment to curries. They are also terrific for breakfast and a snack – wrap around sandwich fillings of your choice or simply spread a little bit of ghee and eat it! 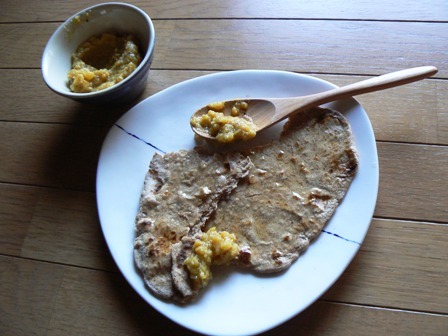 Spread a little bit of ghee over a freshly made still warm chapati and sprinkle jaggery on the top. Or spread a generous amount of peanut butter and drizzle honey over it. Either way, roll up a chapati like a pancake and enjoy! Shift the flour into a mixing bowl. Add oil or ghee to the flour (optional), and mix well until the oil is incorporated. Add salt to the mixture (optional). Make a depression in the middle and add water, a little at a time, and knead the flour to make a dough. Cover the dough with a wet cloth and rest it for 30 minutes. Now take a small portion of the dough (about the size of golf ball) and roll it into a smooth ball between your palms. Flatten the ball by pressing it in a separate bowl of flour. Dust the flat dough liberally on both sides with the flour and roll it out on a flat surface to make a thin and flat chapati. Heat a griddle or a skillet and reduce the heat to medium. Cook the rolled out chapati on one side for about 10 – 15 seconds and flip it over before you start to see big brown spots. Cook on the other side for about 1 minute or until you see brown spots to indicate the chapati is cooked on this side. Keep turning the chapati on the griddle so that it does not stick. Finally, flip the chapati again on the first side and finish cooking for another minute or so. At this stage, a perfect chapati will start to balloon. This process can be helped along by gently pressing on the bread with a dry cloth. Gently press down on a large bubble forcing the bubble to extend itself wider. Alternatively, you can place the first side on a direct flame for 5 – 10 seconds to balloon the chapati. Remove the chapati when ballooned and cooked. Ghee is a form of clarified butter, butter from which water and milk solids have been removed by gentle heating. Ayurveda, India’s ancient healing system, considers ghee to be one of the most health promoting of all foods. In India, ghee is widely used in Ayurvedic medicines as well as in cooking. It is also frequently used for religious rituals as ghee is sacred and auspicious throughout India. Indian cuisine is very popular in the UK, and, in fact, curry has become the nation’s most favourite meal in recent years. Like many other Britons, I’m a huge fan of Indian food. I have enjoyed the numerous fantastic meals at restaurants, take-aways and even my own cooking (eh…not so fantastic in this case…). Unsurprisingly, ghee is widely available in the UK, and I used to keep it in my kitchen cupboard in London. So I was familiar with ghee long before I visited India, albeit my familiarity was exclusively to its use in cooking curry. When I was in India 5 years ago, someone recommended me to drink hot milk with a little bit of ghee mixed in to help my yoga practice. The logic behind this was that ghee would lubricate the joints. Hence it would help me to go deeper into yoga practice. It sort of made sense then and I kept up a nightly ritual of drinking hot milk with ghee while I was in India. 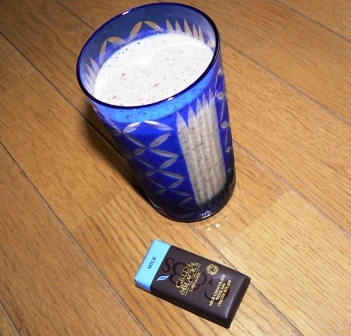 I found, however, the drink very comforting, and that is why I continued the ritual. I’ve started fancying hot milk with ghee again. 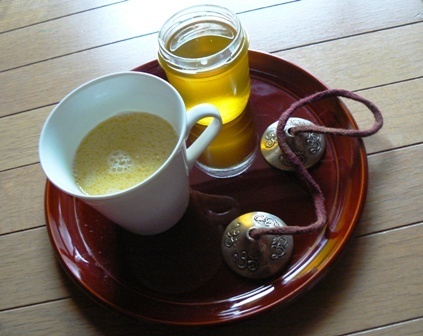 Unfortunately, ghee is not widely available in Japan. I guess they are perfectly ok to use in cooking, but I don’t like the idea of using it my drink. Then I read an article about ghee making in the latest Yoga Journal the other day. I can make my own ghee! It sounded quite easy to make one – all you need is good quality unsalted butter, preferably organic one. You need to simmer the butter in a pot until milk solids are separated from the fat and water from butter is all evaporated. Skim the foam gathered on the surface. Once it’s done, pour the ghee through cheesecloth over a tea strainer into clean containers. Beautiful golden liquid is left in the container! It tastes nutty and comforting. My second attempt was successful! As you would expect, I’ve resumed my nightly ritual of hot (soy) milk with ghee. Oh… ghee is very nice spread over a toast and, of course, you can use it for cooking authentic Indian food! Why don’t you try to make one yourself? In the 60s & 70s, loads of flower children traveled to <?xml:namespace prefix = st1 ns = "urn:schemas-microsoft-com:office:smarttags" />India from Europe, looking for adventures, spiritual enlightenment, and well, for some, mind-blowing drugs. Most of them stayed there for a while, but eventually returned home. Some, however, stayed for good, making India their home. “Hippie Masala” is a documentary film featuring the lives of now aging hippies who stayed behind. 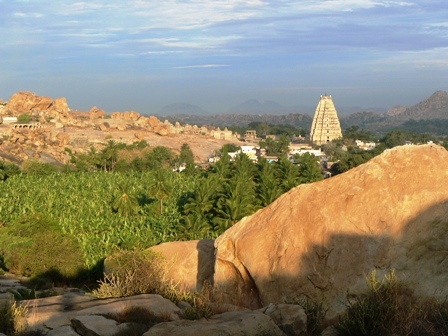 Last year during my trip to India, I met one of the characters portrayed in the film in Hampi by chance. I was having a chai with others at a small village restaurant, when a lady dressed entirely in black arrived with a dog. It was a very hot and humid day - I was sweltering in my thin T-shirts, sweating profusely. The lady, however, looked very cool, both literally and figuratively, in her black top and long skirt. One of my fellow travelers, a German girl, recognised her from the film and we started talking. Her life sounded fascinating – leading a very simple life, living with nature. Can you imagine a life without electricity? Cooking all your food over a camp fire? I haven’t seen the entire film yet, but a little clip I saw on YouTube showed her living in a little hut, cooking her meal in a cave. 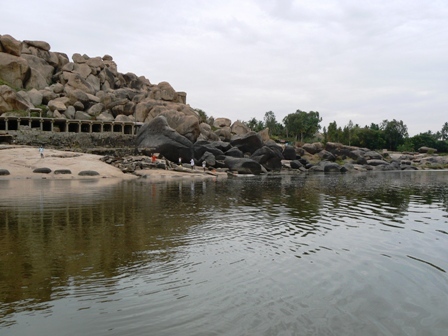 In Hatha Yoga Pradipika, an ancient scripture about Hatha Yoga, the author, Swatmarama, described an ideal dwelling for a yogi – a simple, clean, practical and very natural hermitage, well, just like hers. Most of us possess a sense of escapism to a degree – leaving the busy life in the big city behind and pursue a spiritual life. I certainly have a longing for it. Whether I could live like that permanently or not is a huge question mark, though. Anyway, you can see the entire film online, if you reside in the US. Otherwise, you can see a part of it on YouTube.